I recently had my shutters installed on Monday 13th August at Chislehurst Road. “I’m a regular customer with All Kent Kent Shutters. They’re professionalism, commitment and quality is incomparable. Shutters fitted March 2018. Customer service from All Kent shutters was excellent; the staff who dealt with my order and fitting were Nicola, Joe and Barry. 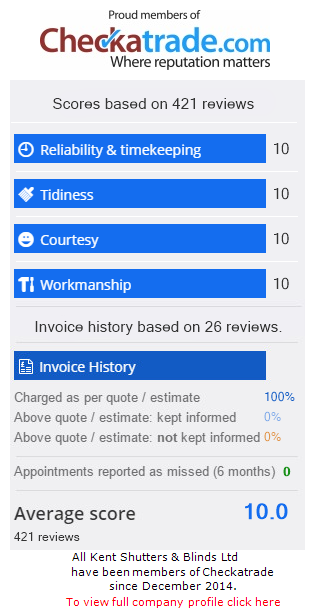 Checkatrade Customer Feedback: Various Blinds fitted: Tidiness: 10 Reliability: 10 Average: 10 Courtesy: 10 Workmanship: 10 Quality and quick service. Friendly and skilled staff. Thank you again for the professional service we received from everyone we dealt with at All Kent Shutters & Blinds. From start to finish everyone was so helpful and efficient. Tidiness:	10	Reliability:	10	Average: 10 Courtesy:	10	Workmanship:	10 Excellent service from start to finish, would recommend ,love my shutters. Just want to say a huge thank you to Joe, Barry and yourself for measuring, organising and installing my new shutters. I am delighted with my new shutters from Joe measuring, Nikki in the office and Barry our fitter was courteous, extremely tidy and his workmanship was excellent. Hi Nikki & Joe, just a huge big thank you for my beautiful Shutters, they are so much better than I imagined. Tidiness:	10	Reliability:	10	Average: 10 Courtesy:	10	Workmanship:	10 From the start to the finish, the service provided by All Kent Shutters was very professional and efficient. I am over the moon with the shutters. Great company from start to finish, Shutters look amazing. Barry was a great fitter and Joe knows his stuff when measuring. Joe and Nikki at All Kent Shutters supplied and fitted shutters and venetians for our house, and we're so glad we went with them. I would just like to provide some feedback following yesterday’s installation of our shutters. Tidiness:	10	Reliability:	10	Average: 10 Courtesy:	10	Workmanship:	10 Fantastic service from start to finish, no pushy sales, excellent advice and superb job completed. Tidiness:	10	Reliability:	10	Average: 10 Courtesy:	10	Workmanship:	10 Shutters fitted very satisfactorily. Clean and professional, very pleased with work and competency, lads were superb. We are so pleased with our shutters. The service we received from everyone from quotation & back up right through to fitting was 1st class. Tidiness:	10	Reliability:	10	Average: 10 Courtesy:	10	Workmanship:	10 Very nice men they even took of their shoes, left no mess very good with my little dog. Conservatory Roof Blinds Tidiness:	10	Reliability:	10	Average: 10 Courtesy:	10	Workmanship:	10 Love my roof blinds. Excellent service. Very friendly and affordable. Tidiness:	10	Reliability:	10	Average: 10 Courtesy:	10	Workmanship:	10 Polite and courteous fitters. All took their shoes off when arrived. Worked quickly, quietly and was tidy. Tidiness:	10	Reliability:	10	Average: 10 Courtesy:	10	Workmanship:	10 Plantation Shutters Fitted and Roller Blind for Bathroom - Excellent work, would definitely recommend. Tidiness:	10	Reliability:	10	Average: 10 Courtesy:	10	Workmanship:	10 Very professional service. Shutters fitted to high standard. Very friendly staff. Have recommended to friends and family. Tidiness:	10	Reliability:	10	Average: 10 Courtesy:	10	Workmanship:	10 Seattle Shutters fitted - Great service, good quality shutters and pleasant and professional fitters. When contemplating having Shutters fitted to the front of our house, All Kent Shutters & Blinds were recommended by a neighbour. Tidiness:	10	Reliability:	10	Average: 10 Courtesy:	10	Workmanship:	10 Very professional service received. Good quality of goods and remarkable finishing to the installation. We are really pleased with our Perfect Fit Venetian blinds, they look fantastic. Tidiness:	10	Reliability:	10	Average: 10 Courtesy:	10	Workmanship:	10 Professional service and excellent workmanship. Very tidy and clean. Would definitely use again and recommend this company. Tidiness:	10	Reliability:	10	Average: 10 Courtesy:	10	Workmanship:	10 Fantastic service from start to finish. Good communication, friendly, respectful and the shutters look fabulous. Tidiness:	10	Reliability:	10	Average: 10 Courtesy:	10	Workmanship:	10 Very clean and tidy from the moment they walked through the door up until they left. Nice friendly company. Tidiness:	10	Reliability:	10	Average: 10 Courtesy:	10	Workmanship:	10 Turned up when they said. Very pleased with work. No mess made. Very polite and professional. "From first contact to completed installation of shutters really pleased with All Kent Shutters, quality installation clean tidy and reliable - would highly recommend"
A really professional service from All Kent Shutters & Blinds, especially Nicola and Joe - from initial contact to completed works. And… the shutters look great! Just wanted to let you know Wendy and myself are absolutely over the moon with the shutters and also wanted to say Barry and his team were very pleasant and amenable. Very happy with all aspects of my experience with this company, from sales consultation, through to fitting on the day and follow up visit. Courteous, very tidy, quality of shutters and fitting. Absolutely love my shutters and couldn't be happier with the service! Highly recommend All Kent shutters! We write to express our absolute delight with our new plantation shutters your team installed on 21 November 2016. We can say in total confidence that they have met our full expectations. Absolutely thrilled with my shutters recently fitted. Would recommend this company to anyone !! Excellent job today - quick installation & no mess. Made a massive difference to the each room - internally & externally. thank you. Thanks so much for our fantastic blinds. We have large, awkward windows but Joe and his colleague accommodated us and the result is great. Even my mum is impressed. Recently had blinds fitted in two of our bedrooms by All Kent shutters and blinds. They are brilliant blinds, received a fab service from Joe and Nikki and will definitely be using them again. 5 stars does not do them justice!!! They are really fab! Cannot believe how my house has been transformed. Brilliant service from start to finish. Thank you! Absolutely thrilled with my Venetian blinds. They look amazing and completely transform the rooms they are in. Roller blinds made to measure and then had them fitted. Beautiful blinds, excellent service, very reasonably priced, would definitely recommend and would definitely use again. We are so chuffed with our new shutters. Joe & Nikki were both so patient with my questions and dithering but we definitely made the right choice. Had our shutters fitted today by Joe who is very professional and down to earth guy who really knows what his doing. Having done a bit of research into who to use to fit and supply our shutters, All Kent came out the most reasonable. Don't bother wasting your time finding someone else! Just had shutters fitted by all Kent shutters & blinds to the bedrooms upstairs and they look amazing. Quality service, products and fitting at very reasonable pricing. Just had shutters fitted by Joe & Tony. 4 Windows including 3 bays. Really pleased with them they look fab & really finish the rooms. Just had our shutters fitted with perfection today, and they look amazing ! Would highly recommend this company to anybody looking for a friendly, helpful and professional team. Our shutters were installed without a hitch and are really impressive. We are so pleased with them. The company came highly recommended and we're the best price around when comparing quotes. Just had wood shutters fitted by All Kent shutters and blinds this morning. We had 7 in total including a big bay window. They look absolutely stunning, done such an amazing job. After having one bay window fitted with shutters earlier this year, we were so impressed with the look, we have just had the whole front of the house done. I Used All Kent Shutters and Blinds for shutters in my bedroom and kitchen, they were recommended to me by a friend, brilliant service and very friendly fitters. We are so pleased with our new shutters, they finish the living room off and the front of the house really looks amazing. It makes such a difference and really adds kerb appeal. This week I had joe and his boys fitting shutters and a lounge door . Excellent product supplied. Very well fitted. Contractor was on time, polite, clean and did an excellent job. Myself and my partner are massively impressed with the workmanship completed by Joe and Darren. We had Shutters and Venetian blinds fitted. Shutter to four windows, one Roman blinds, one roller blind, two velux blinds. Measuring and fitting of wooden shutters in 2 bedrooms. Plantation shutters installed for lounge bay + bedroom bay windows. 8 Sets of Shutters have been fitted in 5 Rooms. 10/10 Service. We had shutters fitted throughout our house. Faultless. Approachable and comfortable. Brilliant service. Great work. Lovely product, hassle free company to work with. Brilliant. Highly recommend. Professional friendly service. They were more than Helpful, just brilliant ! 100% great service. Very efficient and excellent customer service. Very punctual, great customer service. Good value for money and very clean worker. We had white shutters fitted throughout the house. Excellent service, brilliant products. Friendly and professional. Vertical blinds, front bay, small front window. Work completed, cleanly, quickly and very satisfied with result, he was very pleasant and professional. Very happy with result. Excellent service and good communication, friendly, clean and tidy, couldn't ask for more. Shutters fitted at the front of the house. From quote to fitting, this company has provided an excellent service, I am very happy with the end product, could highly recommend. Neat and tidy workers, polite, friendly. Got the job done quietly and efficiently. Really pleased, thank you. Prompt, tidy workmanship to a very high standard. Blinds on conservatory rood and sides. Came and measured conservatory for blinds and ceiling and sides. Work carried out tidily and efficiently with good results. Shutters fitted to 3 windows. First class service by Joe and his team. Quality of work is outstanding. Brilliant service. Clean tidy. Honest. Would definitely recommend. Professional and very friendly service. Supply and fit conservatory blinds - windows and doors. From initial enquiry to completion of job all times and dates adhered to - friendly - tidy excellent service. Excellent service. Very helpful and informative at initial meeting and the shutters look fabulous. Very pleased. Wooden blinds measured and fitted for two front windows. Excellent service and quality. Very satisfied. Venetian blinds fitted to the front of house. Work completed to a very high standard and reasonably priced. As a result, will now be having the rear of the house done as well. Bay window. 3 blinds and 1 other. From start to finish excellent. Blinds fitted on upstairs windows x 3. Excellent service from ordering to fitting my 2nd time using All Kent as they fitted blinds to downstairs in January 15. Excellent company. Fitting of shutters to front and side windows. Quick, efficient, friendly, very satisfied. Installation of perfect fit Venetian blinds. Very efficient and completed on time. Very competitive prices. Very friendly, overall excellent service. I would recommend. Fit blinds to whole conservatory. Am absolutely delighted with my blinds, excellent service, very efficient and friendly, would highly recommend to anyone, Thanks Joe. 11 Venetian blinds fitted 5 pleated blinds, 1 roller blind. Brilliant service, very friendly, helpful and clean and tidy. Quick, efficient and friendly. I would recommend this family business to friends and family. Excellent service and workmanship. Couldn't have been better. Shutters to the front of house. Helpful, clean and tidy, friendly. Shutters installed in three rooms. Excellent service from start to finish. They explained everything in detail and all work completed was excellent and tidy. Excellent service and clean and tidy. Good workmanship and I would be happy to recommend their services to others. Very pleased customer ! A free quotation given after measurements taken and then excellent service for fitting of shutters. A very friendly, helpful and efficient company to deal with. Excellent service, professional from start to end. Shutters look fantastic, plan to use again. Really happy with the quality of service and finish. Friendly and professional. Friendly, helpful, very tidy and great finish, pleased with our shutters. Would definitely recommend. I am really impressed with the work carried out by Joe and his team. I had Plantation Shutters fitted and Perfect Fit Venetians. All Kent Shutters has to be your first choice. Unbelievable service and highly recommend. Top marks for my plantation shutters from All Kent Shutters and Blinds - the price, the fitting and the service. We received several quotes from large brand companies to smaller, local companies and Joe was by far the most reasonable, knowledgeable and genuine person that we met. Plantation Shutters fitted - First class service by Joe and his team. Quality of work is outstanding. Shutters fitted to front of house windows. Many thanks to All Kent Shutters for our Plantation Shutters. Big thank you to Joe & Tony for their brilliant work fitting our Shutters. We are so pleased with the outcome. I have just used this company to install Plantation Shutters at the front of my house and White Wooden Venetians at the back. I have to say, I am so pleased. Great company, fantastic service. Thanks to Joe and Nic for all your help and advice. Would thoroughly recommend to anyone wanting shutters or blinds. We love our new Shutters! I recently had shutters fitted to both my main bedroom windows by All Kent Shutters and Blinds. Absolutely 5 star service. So pleased with my Shutters that were fitted today. I would highly recommend All Kent Shutters to anyone. Just wanted to thank Joe for my wonderful new blinds. White Wooden Venetians are the way forward! Professional service from start to finish. Thank you All Kent Shutters & Blinds, as always excellent service from quote to fitting for our Bedroom Roller Blinds, will be requiring your services in the near future. I just wanted to say that my Wooden Venetian Blinds look amazing - I am so so happy with them! Thank you so much — feeling happy. Thanks so much for our fantastic blinds. We have large, awkward windows but Joe and his helper accommodated us and the result is great. Even my mum is impressed! Absolutely thrilled with my Wooden Venetian Blinds. They look amazing and completely transform the rooms they are in. I only asked for a quote and had to cancel after, as my plans changed but the customer service was very polite and very helpful. I'll keep them in mind for the future. Great service and good quality blinds. Thanks. Fantastic professional friendly service, couldn't fault them. Would recommend them very highly. Absolutely 5star service, so pleased with my roller blinds that were made and fitted by Joe. Would recommend these guys to anyone needing any new blinds! Very reasonably priced. Love love love my blackout blind and our beautiful bathroom Shutters!! We are really chuffed with the Wooden Venetian and Roller Blinds Joe fitted. Very prompt and professional servie. Would not hesitate to recommend. Beautiful!! Changed the whole look of the room. Gotta say, so pleased with my blinds and shutters, I've had fitted throughout. Good price and great service! Thank you to all that helped at All Kent, especially Joe, fantastic crafstman. Fantastic Shutters and Service, Highly recommended. We had our blinds fitted in the entire house and they are absolutely gorgeous and perfect exactly what we wanted. ★★★★★ We are really chuffed with the Wooden Venetian & Roller Blinds Joe fitted. Very prompt & professional service. Would not hesitate to recommend. Love our beautiful wooden Venetian blinds, wood absolutely recommend to anyone! We had our Shutters fitted on Sunday in our Bathroom, they look beautiful. We are so happy with the work All Kent Shutters had done. Absolutely LOVE the Shutters, they are beautiful, really pleased, I have already recommended you to two of my friends and I know one of them is definitely going to go ahead. We have recently had our Shutters and we LOVE them. What a fantastic job All Kent Shutters and Blinds have done for us. We cannot recommend them enough. All Kent Shutters and Blinds did my whole house with blinds. I contacted many companies and received some ridiculous quotes but these were so cheap in comparison. Excellent Job!!!! Extremely pleased. Two roller blinds installed quickly and neatly. Definitely recommend. Great blinds fitted today - well pleased. Love Love Love my shutters. Best thing I ever did. Totally recommend. Can't recommend them enough. They made me 6 beautiful roman blinds with our own Laura Ashley fabric. They are fab. I used Kent Shutters and Blinds. The quote for my whole house was £970 and I had quotes for well over £2000. Very pleased and he is a great guy. I have used this company for a number of years. I have had roman, vertical, Venetian and roller blinds over the years. They have always provided a great service and prices are very reasonable. Can Highly recommend All Kent Shutters and Blinds, I used them for my Shutters (was recommended to me by a friend).